Postcard, posted on February 5, 1909, showing the Rosalind Club located 37 North Orange Avenue in Downtown Orlando, Florida. It was constructed in 1901 in the Neo-Classical Revival style as a reproduction of the Biloxi, Mississippi home of Jefferson Davis, the first and only President of the Confederate States of America. Davis' niece, Lucy Hayes Lawrence, chose the design. The building was moved to Colonial Drive circa 1921 to make room for the Angebilt Hotel. The original owner was the Sorosis Club. In 1903, it became the home of the Rosalind Club, which was founded in 1894 as the Ladies Social Club of Orlando. The Rosalind Club remained there until 1916 when their new building was finished on the shore of Lake Eola, on the street that became Rosalind Avenue. After 1916, the building was used by the Chamber of Commerce and the Rotary Club. It was bought by M. J. Daetwyler and moved to Colonial Drive for use as an apartment house. Originally published by W. S. Branch. Copyright to this resource is held by W. S. Branch and is provided here by RICHES of Central Florida for educational purposes only. Rosalind Club House, Orlando, Fla. Such an excitement yesterday Mr. Miller set fire to a brush pile and it was so dry it spread clear to the orange grove and every one had to get out[?] and fight. No damage to grove. Then the dog caught a rabbit. Burned some of the fence posts and E[?] and I saved several others. 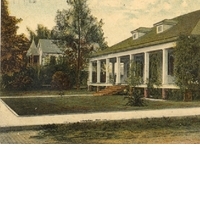 “Rosalind Club House Postcard.” RICHES of Central Florida accessed April 21, 2019, https://richesmi.cah.ucf.edu/omeka/items/show/1011.